Bring home this set of Two accessories to add style in your attire. 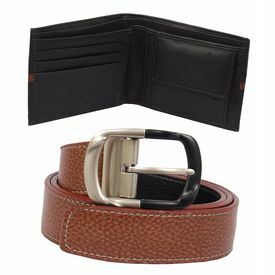 Having an ultimate design, the Toreto wallet,& Belt are very attractive specially presented from the well known brand . Belt and watch provide you a completely different look in which you are not less than a hero and a wallet with smooth finish are made up of leather having bi fold closure. Hence the style statement is going to change when you enter in a party by having this cardholder for business class people as it helps you to grab compliments.